We Work Harder to Make Choosing MDM Software System Easier! Make Choosing MDM Software Accurate! These customizable templates contain over 3,810 MDM system selection requirements, enabling you to obtain better decision-making data during ALL steps of the MDM software selection process. Identify ALL important MDM User Needs - All User Needs & Planning Templates are included FREE! Accurately scope your MDM project, then use the Work Distribution Chart (WDC) and/or User MDM Survey to identify user needs and workflow problems quickly and reliably. Detailed MDM Requirements Identification - Prevent Fatal Omissions! This Requirements Checklist with Fit-GAP Analysis provides thousands of MDM selection criteria to ensure fast, easy identification of ALL your needed MDM functions, enabling comprehensive collection & prioritization of all MDM software requirements. Quantitative Master Data Management Software RFP Preparation - Obtain Better MDM Selection Decision Making Data! - Use this MDM RFP template to quickly prepare a quantitative RFP tailored to your MDM software needs. Utilizes professionally written criteria optimized for use in quantitative vendor response analysis processes that facilitate more accurate MDM software selection decisions. 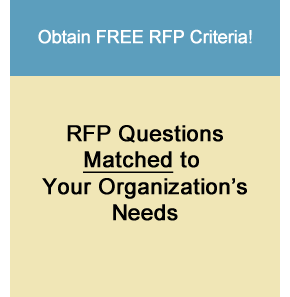 Actionable & Consistent Vendor RFP Responses (Proposals) - Elicit Easy to Evaluate MDM Vendor RFP Responses! - Obtain detailed MDM system responses (proposals) in a consistent, easily compared and evaluated format through the use of the built-in, automated MDM vendor input validation included in this RFP template. Automated MDM Software Proposal Evaluation - Evaluate MDM More Accurately! Save Time! - Eliminate the time wasted trying to manually clarify and score vendor responses, then evaluate each vendor's proposed MDM system. Choose the best MDM software by using AUTOMATED response scoring that eliminates the need to manually score thousands of vendor responses. Quickly evaluate MDM system proposals! Vendor MDM Software Response Quality Analysis - how good are the techniques and structures of the vendor proposal? Weighted Grade Score - how suitable is the proposed system to your actual current and future needs? Supportability Score - how much on-going support will a proposed software system require over time? Extensive Financial Ratios - is the proposed system really a good investment? Payback Analysis - how fast will the MDM software pay for itself? These powerful vendor response evaluation templates for MDM systems ensures impartial and accurate analysis of all competing vendor MDM software proposals at the weighted grade score, supportability, and financial levels, all to assist you in selecting the best MDM software system for your needs. MDM Software Comparison - "Apples-to-Apples" comparison of MDM system features - in detailed, "heat map" format, ensures accurate MDM software selection. Select the best MDM system! These master data management (MDM) system vendor response (proposal) comparison templates ensure impartial and accurate evaluation and comparison of all competing vendor MDM software systems at the detail feature, weighted grade score, supportability, and financial levels, all to help you select the MDM software most suitable to your organization's requirements. 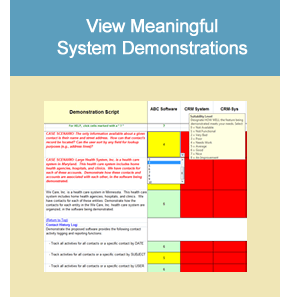 Demonstration Scripts - Ensure vendors present actionable demonstrations tailored to your needs. Scheduling Function allows different groups of MDM demo attendees to be scheduled for specific time slots. Demonstration sessions can be scheduled over several days. Organized by Departmental Business Function, enabling different user attendee groups to see just those functions specific to their daily needs. Quantitative Scoring ensures accurate, meaningful ranking of all MDM demonstrations. Heat Map Color Highlights the strengths and weaknesses of each MDM system demonstrated. Use this MDM software demonstration script template to ensure that vendors show how their proposed system supports complex tasks and/or mitigates time consuming exceptions to standard business processes, or clear up any confusion found in their RFP response. Visual inspection is worth 10,000 words when choosing MDM software. Select the best MDM software solution using meaningful, actionable information. Make choosing Master Data Management (MDM) software solutions easier and more reliable. These MDM software evaluation & selection templates use quantitative system criteria to enhance the reliability of each step in the MDM software selection process. Please see the Toolkit List at the bottom of this page. QUICKLY & ACCURATELY IDENTIFY ALL MDM REQUIREMENTS - Save weeks, even months, of time when identifying your MDM software needs by using a detailed requirements checklist that queries users about their needs in all MDM business processes. These detailed MDM software requirements checklists include a full Fit-GAP analysis matrix that covers all standard MDM operational issues (see Fig. 1.0 below), and significantly reduces the time needed to fully identify and prioritize all of your firm's MDM requirements, sometimes by as much as 90%. Comprehensive Fit/GAP ANALYSIS Features are provided in this MDM user requirements checklist to help you quickly identify, categorize, and prioritize MDM software requirements and user needs. Quickly obtain the information needed to accurately select the MDM software system best for your needs. Customizable attributes suitable for use in any MDM system environment, including PeopleSoft, SAP, Oracle, Siebel, MS Dynamics, and similar. Avoid Overlooked MDM Requirements! - This checklist is pre-loaded with thousands of system requirements, guaranteed to investigate all aspects of an MDM software/system acquisition and implementation. Streamlines your MDM software selection project immediately since the chances are very good that it will remind someone of something they forgot! Many expert MDM software consultants state you must first identify all your MDM requirements before attempting to select MDM software. But what does the phrase "identify your MDM software requirements" really mean? Managing the entire operational environment of any organization requires decisions about many crucial requirements. Each of these MDM Software Requirements Checklist with Fit-GAP analysis will save you time (and money) during the task of identifying your company's critical MDM system requirements, and correctly prioritize the many software issues that must be addresed to select the best MDM software! Identify a specific organization's unique and/or hidden software requirements. Answer questions such as "How could a new MDM system better handle sales orders for customized products? ", or, "How can the procurement time be reduced for raw materials required for a specific special order? ", plus many others. All good questions when trying to select MDM software. 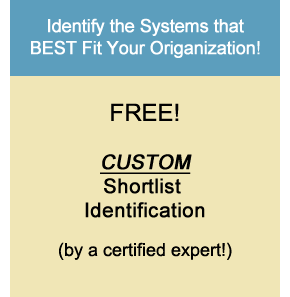 Identify the RFP criteria required to choose the best MDM system software based on your organization's needs. Determine if your current MDM software problems are the result of workflow or software deficiencies. Identify the solution to each workflow issue or shortcoming in your current MDM software. 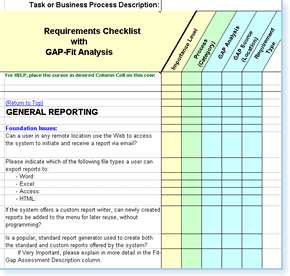 Each MDM Software Requirements Checklist with Fit-GAP comes pre-loaded with thousands of MDM system criteria presented in a form useful for doing the above tasks, all very much required when trying to select MDM software. Drastically reduce, or even eliminate the time normally wasted during the MDM selection process! 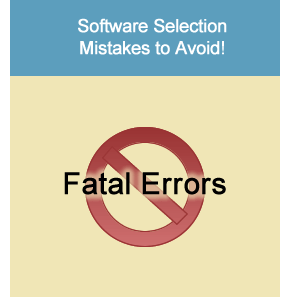 Significantly lower the risk of picking the incorrect software system. Reduce the time spent researching and developing requirements from scratch, since all templates come ready-to-use, pre-loaded with a list of over 3,810 MDM (MDM) software selection criteria (categorized below). This enables you to immediately conduct user needs surveys, query vendors about complex MDM software systems, and conduct relevant software demonstrations - everything needed to select MDM software successfully! If you do not see what you need, or have questions about what type of MDM software system is best for your operations, please Contact Us! We have more than 30 years of direct "hands-on" master data management (MDM) selection experience with organizations of all types, ranging from small to XEROX-size. Our MDM software advice and support is always free! Accurately choose the best master data management (MDM) software by querying vendors about all of your firm's specific MDM system needs. Prevent do-overs that waste time and money. Start your project on the right track by using well-focused MDM software selection questions to obtain better, more precise information from vendors, and then evaluate and select ERP system software based on your exact needs. 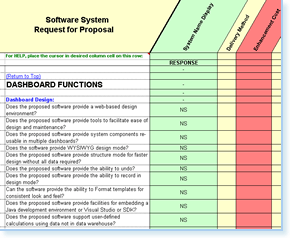 These detailed yet easily customized Request for Proposal template sets come (see Fig 2.0 below) pre-loaded with over 3,810 MDM system selection requirements that will enable you to quickly create an RFP tailored to your specific MDM requirements using familiar Excel Add, Delete,and "Cut and Paste" type commands. Each RFP template and selection toolkit is guaranteed to address all industry standard and many "exception case" MDM functions and processes. Designed by experts to select MDM software using quantitative evaluation criteria, these RFP templates ensures you receive easily compared and evaluated vendor MDM software system responses (proposals). 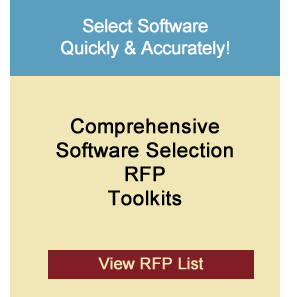 Each RFP Template and Software Selection Toolkit listed below for MDM software systems enables you to easily and accurately select the MDM software system best for your needs. Evaluate & Score MDM Software Proposals Automatically! - Quickly and accurately evaluate vendor master data management software / system RFP responses (proposals) with the automated response evaluation tools included with this RFP! Avoid the time wasted by the need to manually evaluate and score each individual answer in each vendor RFP response. Avoid the errors that such a laborious task entails. These RFPs and evaluation toolkits include a comprehensive and customizable set of automated weighted score, supportability score, response quality, and financial ratio calculations, with results displayed in side-by-side heat-maps and comparison scorecards. These functions automatically analyze each MDM vendor's RFP response in an unbiased, consistent, and quantitative manner to provide the information needed to help you select MDM software best suited to your needs. 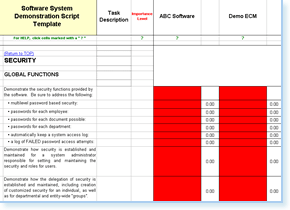 MDM DEMONSTRATION SCRIPTS (See Fig 3.0 below) - The purpose of an master data management software demonstration is to investigate and illustrate the potential strengths and weaknesses identified in each MDM vendor's RFP response (proposal). Make sure all vendor MDM system demonstrations consistently address these issues as well as your firm's overall requirements. This template set enables each MDM software selection team member to consistently score each demonstration based on his or her priorities. Simply add the features and functions you want to see in a demo and you are ready to go! View details and examples for MDM Demonstration Script template capabilities. These templates are ideal for managing on-site demos that may last several days and involve different MDM user groups from several departments, each with their own set of needs and requirements. Be sure each MDM system vendor demonstration stays on schedule and addresses everything the IT and End-User team wants to see. Ensures all vendor software demonstrations are easy to evaluate and compare by requiring all functionality is demonstrated in the same order and scored consistently by all team members. Ensure your MDM system selection is fast and accurate! If you have questions about using the MDM system evaluation and selection templates above, or how to select MDM software in general, please Contact Us! We have over 30 years direct "hands-on" database and software selection experience. Advice & Support from an MDM Software Selection Expert is Always FREE! Select the Best Master Data Management (MDM) Software System! All MDM system evaluation and selection templates shown on this page can be purchased together at a significant discount (see Toolkit Option #1 - BUNDLED), or each can be acquired individually, as needed (see Options 2 & 3). Each option is listed below. BUNDLED - Includes ALL MDM System Selection Templates. - Save $149.00! Receive FREE Advice & Support from a MDM Software Selection Expert! Evaluate & Select MDM System Software Accurately! How NOT to Choose an MDM System!